Planning an outdoor party and unsure of the best way to serve a healthy bite of beef? 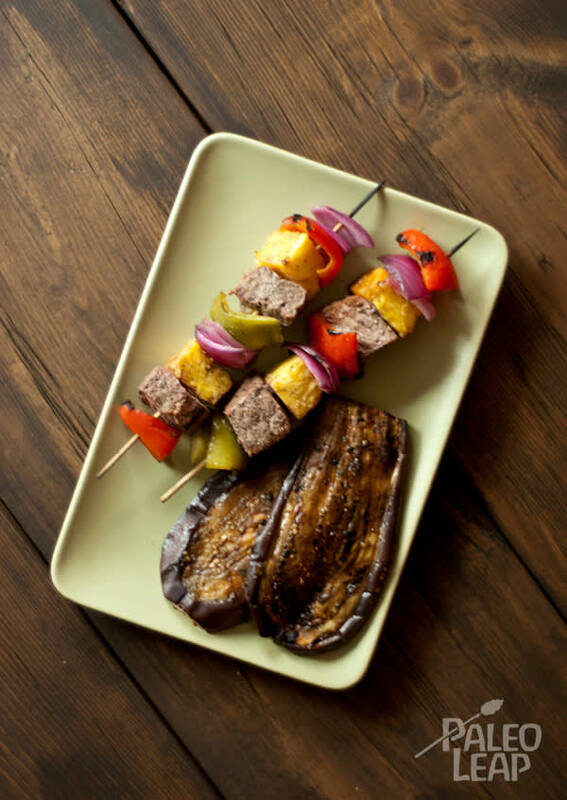 These pineapple-beef kabobs with grilled eggplant have you covered with serving the main dish, though you still need to arrange a tantalizing dessert, and perhaps a glass of fine red wine to round out the evening. If the sun happens to set while you are out by the grill, consider it a bonus from nature, or just excellent timing on your part. Choose your cut of beef wisely. For kabobs, you will want meat that is perfect for the grill, fast-cooking and not too tough. The most expensive options – the top of the line – are also the most tender. These include filet mignon and porterhouse, a fine rib-eye will seal the deal as well. None of these require a marinade to grill properly. If you are on a budget, never fear, all types of steak can be grilled to perfection with a little know-how. Sirloin steaks will be more flavorful if marinated a few hours before getting toasty, even chuck roast will become tender when tossed in a citrus steak marinade. Make your plans well ahead of time and everything will turn out smoothly, that’s what all chefs hope for anyway! For dessert, chill down with a refreshing bowl of mango and strawberry sorbet as you let the conversation carry on into the night. Soak skewers in water for approximately 10 minutes. This will help to ensure they do not splinter and burn. Once skewers have been soaked, add remaining ingredients alternating onto skewers. Be sure to puncture the meat and vegetables in the middle so that nothing falls off the skewer when cooking. You should be able to fit at least two of everything on each skewer. Place on grill and cook approximately 10-15 minutes, rotating to cook all sides. For BBQ eggplant: Combine all of the ingredients in a small bowl, minus the eggplant, and mix well. Brush the mixture on both sides of the eggplant slices. Place eggplant on the barbecue over medium-high heat. Allow to cook for 4-5 minutes on each side, or until slightly charred.